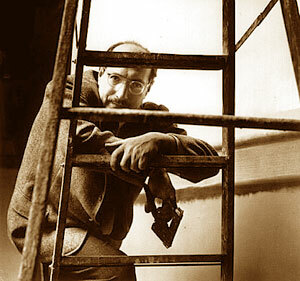 Mark Rothko, one of the leading participants of Abstract Expressionism, was born Marcus Rothkowitz in 1903 in Russia. He moved to Portland, Oregon in 1913 with his mother and sister, which reunited him his father and two brothers who were already there. Rothko settled in New York in 1925 after going to Yale for two years, and began to study painting at the Art Students League under Max Weber. Despite Weber's impact on his early development, Rothko was later to state that was largely self-taught and had "leaned painting from his contemporaries in their studios." He participated in his nfirst New York group exhibition at the Opportunity Galleries in 1928. Around this time, he became friends with Milton Avery and Adolph Gottlieb, whose simplified forms and flat color areas influenced Rothko’s work. 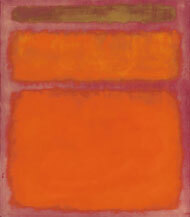 Rothko’s first solo show occurred back in his hometown at the Portland Art Museum in 1933. In 1935 Rothko and Gottlieb founded 'The Ten,” a group of artists whose mission was "to protest against the reputed equivalence of American painting and literal painting." The Ten sought to communicate human emotion and human drama through their paintings. In 1936, Rothko began writing a book, never completed, about comparisons in children’s art and the work of modern painters. According to Rothko, the work of modernists, influenced by primitive art, could be compared to that of children in that "child art transforms itself into primitivism, which is only the child producing a mimicry of himself." In this manuscript, he stated "the fact that one usually begins with drawing is already academic. We start with color." 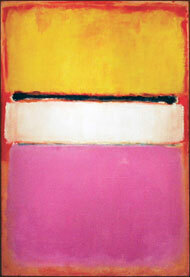 Rothko began to develop his distinctive style around 1947, turning to complete abstraction. His paintings often featured large rectangles of color in vertical juxtaposition, which became symmetrical in presentation by 1950. 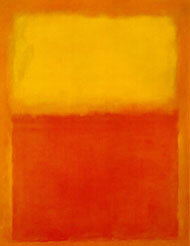 Along with Barnett Newman and Clyfford Still, Rothko is considered one of the founders of color field painting. His paintings were intended to entirely envelope the viewer and raise the viewer up and out of the mechanized, commercial society Rothko despised. His color contrasts were carefully selected to convey a wide range of human emotions from menace and despair to hope and euphoria. Rothko’s life was shadowed by his severe depression, and likely an undiagnosed bipolar disorder. In 1970, at the age of 66, he took his own life. Painting consumed Rothko’s life, and although he didn’t receive the attention he felt his work deserved in his own lifetime, his fame has dramatically increased in the years following his death. Some of his most impressive works were not to be seen until after his death in 1970, when his murals for the nondenominational Rothko Chapel in Houston, Texas were finally unveiled. The dark and somber works he created for the chapel are thought by some to foreshadow the artist’s suicide. These 14 final works achieve an awe-inspiring quality when viewed in the tranquillity of the building itself. The Guggenheim Museum organized a major retrospective in 1978.